"We have a European bureaucracy, totally unaccountable to anybody. Powers have gone from national parliaments, they haven't gone to the European parliament, they've gone to the Commission." Not a quote from Nigel Farage but from Labour leader Jeremy Corbyn. I confess that whilst I disagree with large swathes of his politics, I was rooting for Corbyn to win the Labour leadership. Aside from the cynical desire to see socialism quashed in UK politics for at least another generation, here was a man who had routinely defied the party whip throughout his tenure in parliament and stuck to his principles - a trait sorely lacking in Westminster. 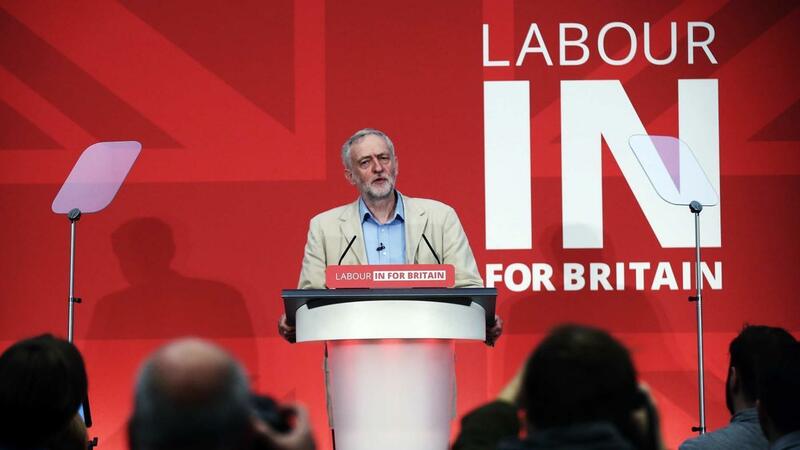 Moreover, Corbyn had a lifetime of Euroscepticism and criticism of the EU behind him. David Cameron had promised an in-out EU referendum and having narrowly won a majority in the election, we would be getting it. Here was an opportunity to have a lifelong Eurosceptic lead the second largest party in UK politics and make the left-wing case for withdrawal, devoid of the unpleasantness some feel that UKIP taints that idea with. Alas, after his speech today, Corbyn has stuck to the general theme of his opposition and disappointed, setting out as he did a case for Remain. Corbyn of course stated back in February that he would be backing the Remain camp, thus performing a complete 180 on his previous stances. He voted to leave the then EEC in 1975, he voted against the Maastricht Treat in 1992 and the Lisbon treaty in 2008. His website was full of articles decrying the EU and it's corporatist nature, which have now been taken down, displaying the sort of double-dealing and hypocrisy that his supporters saw him as an answer to. The main thrust of Corbyn's speech was that yes, the EU is awful, so that's why we need to stay in in order to reform it. This completely disregards the EU's unwillingness and inability to reform, as David Cameron discovered in his ill-fated 'renegotiation.' Indeed, one of the most impressive diatribes Corbyn almost gave was his evisceration of Cameron over his inability to achieve any meaningful reform. I say almost because he rightly lambasted the EU's failure to stop the erosion of jobs in vital sectors like the steel industry. He pointed out that the EU enforces the privatisation of public services (meaning that Corbyn's policies of rail re-nationalisation and the like are incompatible with EU law). He decried their austerity measures, their failure to protect worker's rights, and it's severe lack of democratic accountability. Unfortunately, Corbyn shunned the obvious conclusion of this litany of offences and endorse an exit from the European Union, instead opting to back staying in regardless. It's entirely possible of course that Corbyn has indeed reassessed his view on our EU membership, though one can't help wondering if this about face is more to do with trying to maintain some sort of party unity. The early days of Corbyn's leadership were dogged with infighting and disagreements over policy, such as Trident for example, and at the time of Corbyn's announcement he would be backing In, a further split could well have spelled disaster for his fledgling leadership. Indeed, when asked why he had changed his mind, Corbyn stated that the Labour Party backed EU membership and that 'that's the party I lead and the position I am putting forward', suggesting that this speech was by Jeremy Corbyn the leader of the Labour Party, rather than Jeremy Corbyn the man. It was also telling that one of the arguments Corbyn made was the threat of the Tory party dumping worker's rights such as maternity pay, annual leave and equal pay. Never mind the fact that the Conservatives have no such policies - it would be electoral suicide if they did - but supposing the British electorate wanted a more deregulated, free market economy and voted for a party to implement such a scheme. Corbyn is in effect endorsing the overrule of British democracy by the European Union, the biggest bone of contention that every advocate of a Leave vote from all over the political spectrum has with the EU project. So yes Jeremy, I understand the need for party unity, lord knows we could use an effective opposition right now, that your party is currently far from providing, but it's a shame that in the name of that unity, you have abandoned that trait which your supporters revered and your opponents, however much they may disagree, respected; your elevation of principle over politics.